Story written by Peter & Ellen, photographs by Ellen. 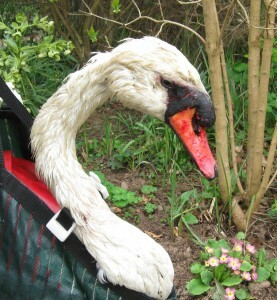 Calls requesting help to deal with a distressed or injured swan almost always come from telephones which are land based. 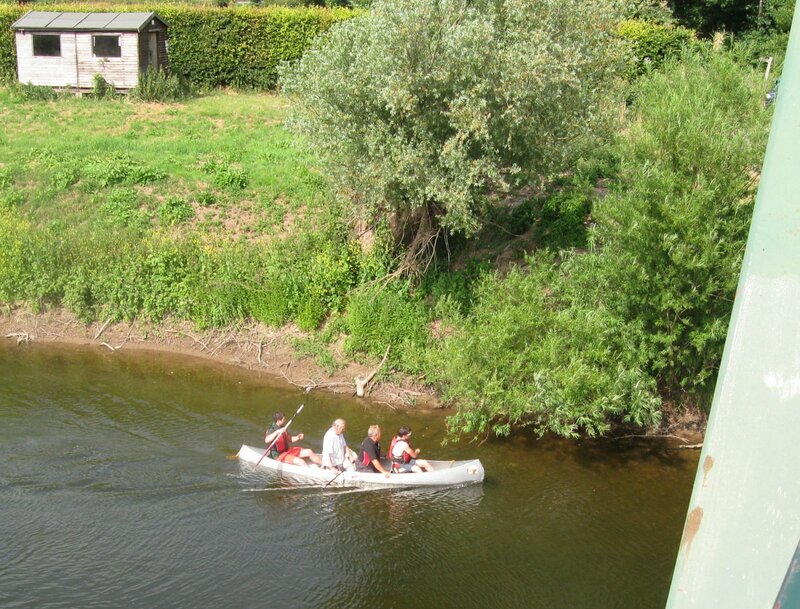 But, thinking about it, given the ubiquitous nature of mobile phone ownership, it is perhaps surprising it took until July (2013) before we received a call from Daniel who was canoeing down the River Wye towards Symonds Yat. He had noticed what he took to be a very poorly swan – probably carrying fishing tackle – in the shallows, and not associating at all with the other swans nearby on the river. At the time, we were on the M5 returning from having delivered a number of baby gulls to the WildlifeHospital at West Hatch near Taunton. Thank goodness for the extended hours of daylight at this time of year as we still had something like 100 miles to travel before we could start looking for the swan. Daniel had given us very precise instructions; we had to find a particular field containing pale brown cows and amongst which was a large bull …! Well, we found the field, and then, with not a little trepidation selected a circuitous route leading to the river bank. 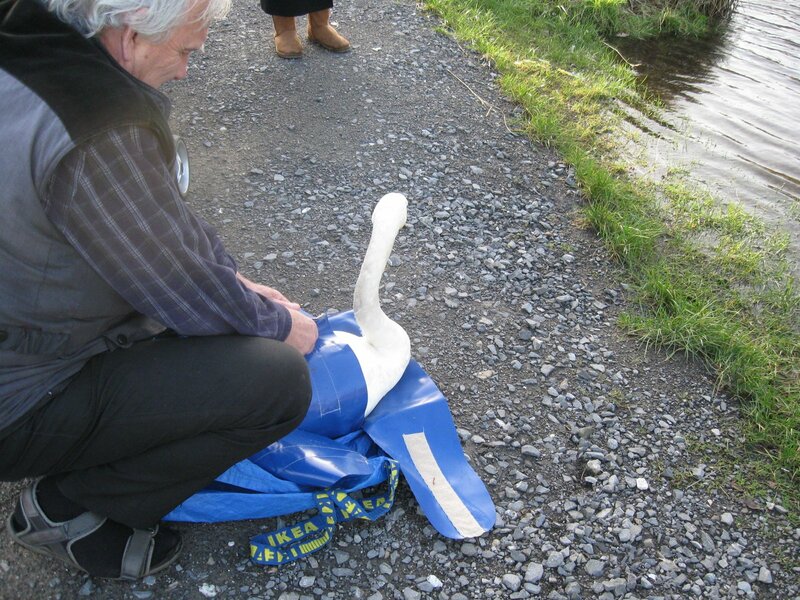 We found the swan, and clearly, he was in serious trouble, and so too, in a way, were we. The bank at this stage is extremely steep, and being July, the water level was low, so making a descent a very hazardous undertaking – quite apart from the difficulty of climbing back up the bank with the swan – assuming, of course success in catching him. Success seemed more likely to be assured by making an approach from the river itself. Fortunately, we’ve worked in this area before, and so we know a few people. 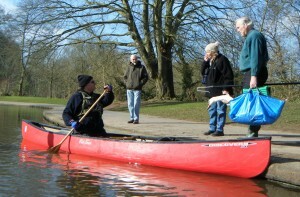 One such is Chris who owns and runs a local canoe hire business, so we called upon him. Chris was his usual friendly and co-operative self, but, being the holiday season was extremely busy – a situation made worse by the fact he was also short staffed. He was perfectly willing to do what he could to help, but not before the second half of the following day. As things were, this enforced delay was not a problem at all. In response to another call from Tata Steel at Port Talbot, there was a need to travel west first thing to collect an injured gull; this was passed to Vik who runs FAUNA Wildlife Rescue in Cardiff. Amidst all of this, there was another call – this time from Llandarcy, the site of a long since dismantled oil refinery near Swansea, but now an immense urban renewal site, where we knew of two oiled swans. Previous attempts to catch them had failed, but now an elevated level of concern was being expressed regarding their welfare. So, with there still being sufficient time for another trek down the M4 before presenting ourselves at Symonds Yat, we set off once again. Unfortunately, catching these birds was never going to be a practical proposition on this occasion – but that’s another story! And so back to Symonds Yat, where our first task before making contact with Chris, was to obtain a precise location for the swan. This proved to be straightforward; he had moved only a short distance from where we had seen him the previous evening. Given the complexity of Chris’s arrangements and commitments, he decided to accompany us back to where we had last seen the swan, and so to make his own assessment. By now, the swan had crossed the river and was on the far side, but was clearly very lethargic/weak. What followed seemed to happen very quickly. We were close to the bridge which provides road access to Symonds Yat East, where, most importantly, there was reasonable access to the waters edge. 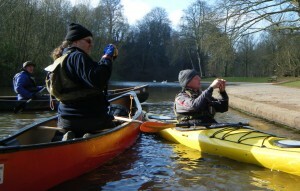 As luck would have it, there were a few canoeists fairly close by (in boats hired out by one of Chris’s competitors!). Chris hailed one of them, explained the problem and secured their agreement to allow Chris and myself aboard. Thus it was, with one heavily overmanned canoe, and a hugely overweight angler on the bank with a net, we succeeded in capturing ‘our’ swan. It is no exaggeration to state it took us a matter of seconds to establish the full horror of what had befallen this poor hapless swan. Well to the back of his tongue was lodged a medium sized triple barbed hook, which, to make matters worse, was showing signs of significant corrosion. 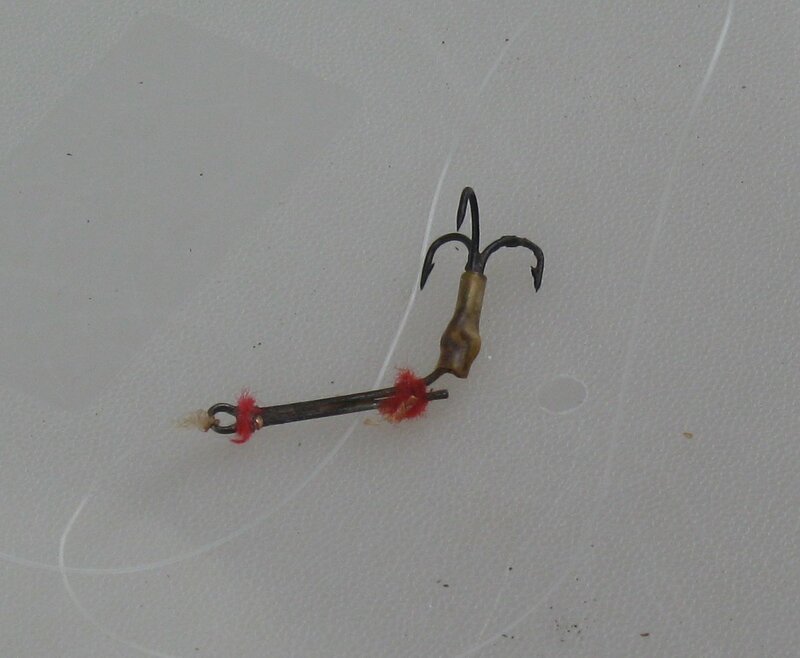 The shaft of the hook was jammed against the lower outside part of the beak and had already started to cut into it. Small wonder, at 6.5 kg, the bird was seriously underweight, and would not have eaten for many days. For fear of making matters worse, the next decision was amongst the quickest and easiest we have ever made; we needed to get this bird to the Swan Sanctuary at Shepperton as quickly as possible, in the certain knowledge the appropriate skills and equipment would be used immediately to bring the torture to which this poor bird had been subjected to an end, and also to guarantee the requisite level of aftercare, including the necessary application of antibiotics. We are under no illusions as to another aspect of this awful story. The fisherman who will have known he had lost the hook – a truly awful instrument of torture as it turned out – will not have spared a moment’s thought as to the consequences of his loss. It would be good if we could be certain a few fisherman stumble across this article, and pass on the essential message which it carries, that is quite apart from the crucial role played by one caring canoeist who spotted the problem, and the indispensible help provided by Chris in making the rescue possible. Without these, this swan would have died alone and in agony. We owe them both our sincere thanks. The Gwent Levels are an extensive area of land located on the north side of the Severn Estuary in east South Wales, outside Newport. They are an important wetland resource and one of the largest surviving areas of ancient grazing marshes and reen systems in Britain. Reens, spelt rhyne in England, are drainage ditches which have several purposes apart from their main function of conveying water – one being to prevent adjacent land from drying out in the interests of conservation and agriculture. Without this system, thousands of acres of good agricultural land would be flooded every year. The Gwent Levels is of national significance for its wildlife and archaeology and one of the last surviving areas of ancient grazing marshes and reen systems in Britain. Unfortunately, the reens also provide ideal places for fly tippers to off-load their unwanted rubbish. 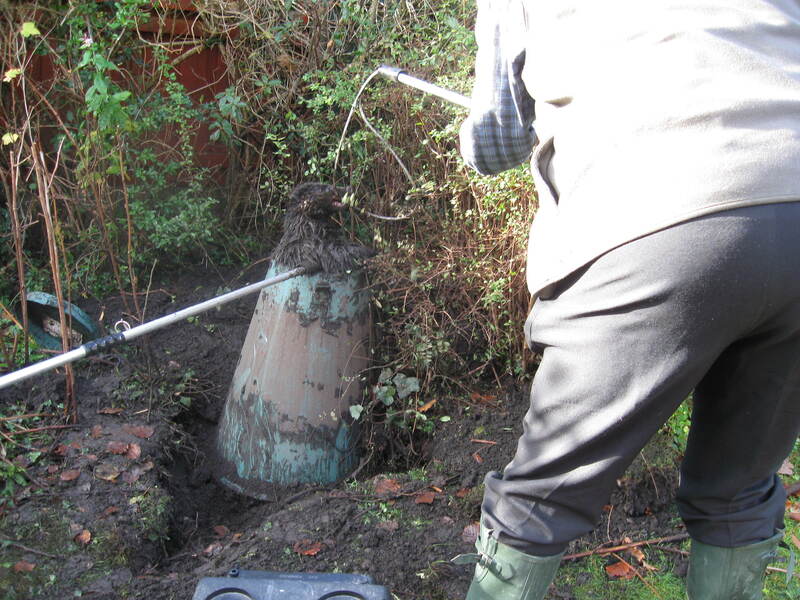 This can be anything from builders’ rubble, garden waste, lopped tree branches and worst of all oil, or similarly unknown and often difficult to remove substances. It was one of these ‘unknown substances’ which prompted a call from Maggie, the person who owns the local horse stud at the top of Blackwall in Magor. The reens, which are mostly protected on both sides by high growing undergrowth of bracken, reed mace, hedge parsley and yellow iris etc. are ideal nesting sites for swans. All the local people know where they are so if anything happens to any of them, they know about it and we are alerted immediately. Maggie rang to tell us the family of swans which have used the reens around her property for many years had turned black !!! It was early evening with the light just beginning to fade when we arrived. 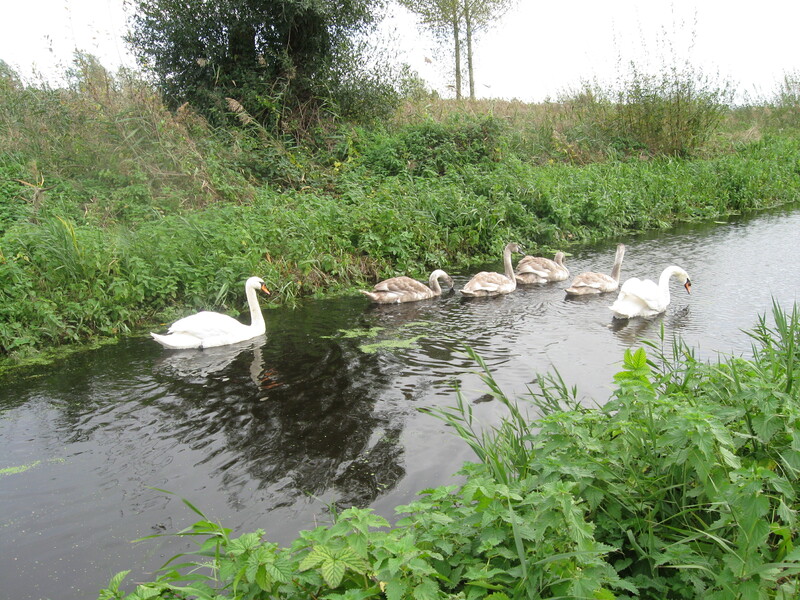 She directed us to the reen running along one side of her field where we could just make out the long necked shadowy shapes of four cygnets and two adults, the latter only recognisable by the orange red of their beaks. Although we were equipped to carry six swans in the car, what we hadn’t appreciated was how quickly we could ‘lose’ their shadowy shapes in the fading light. Eventually however, and with help from our two local ‘helpers’, Len and Jack (and sometimes the horses joined in), we were at least able to catch the two adults. The cygnets would have to wait till another day, after all, they were big enough now not to need the protection of Mum and Dad. 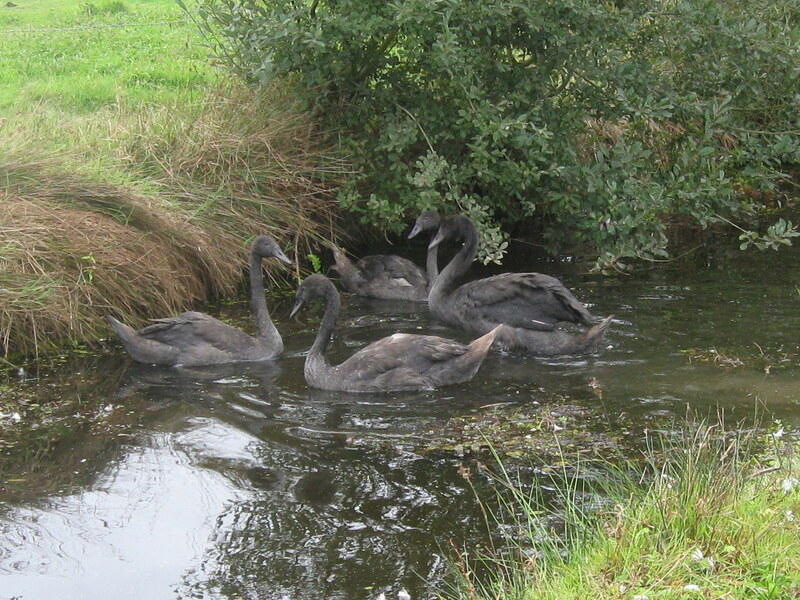 The following day we were on the M5 to the West Hatch Wildlife hospital near Taunton with the two adult ‘black’ swans. West Hatch is where the majority of oiled sea birds are taken for washing, rehabilitating and their release. A repeat journey was made the next day after we had managed to catch two of the four remaining cygnets having failed to even find the others. At West Hatch we had a look at the adult birds after their first wash and were extremely surprised to see whatever it was they had managed to cover themselves with, had almost completely washed off and they were back to their beautiful snowy white again. Interestingly, they still had their water proofing. So the identification of this substance was a mystery. It had no smell, it was not greasy but had a sort of smooth, very slightly gritty texture. We collected some of the discoloured feathers with the intention of trying to get the substance analysed but unfortunately the VLA at Langford which is always extremely helpful, does not have facilities to do any toxicology testing although their suggestion it could be some sort of graphite lubricant sounded quite plausible. On the third day Maggie phoned to say she had found the remaining two cygnets but catching them was going to prove difficult if not impossible as they were in a reen which was protected by some very unfriendly undergrowth so to be on the safe side we contacted Red Watch of the Fire and Rescue in Newport. As always, they were brilliant and arrived in full force within the hour. Donning their ‘health and safety’ gear three of them were in the waist high, definitely rather doubtful looking water of the reen on the opposite side of Blackwall to the stud. Within ten minutes they were back out complete with the two remaining ‘black’ Mute swan cygnets wrapped and in their Ikea bags ready to be on their way down the M5 to the wildlife hospital for their wash and brush up and to be re-united with the rest of their family. We look forward to the day we can bring them home and back to the reens which have been their home for many years. And then they came back to the reens which have been their home for so long. TredegarPark comprises 90 acres of beautiful gardens and parkland within which stands an outstanding example of late 17th century architecture – Tredegar House. The property has been acquired recently by the National Trust from its former owners – Newport City Council. It is situated adjacent to junction 28 of the M4 motorway, immediately to the west of Newport. It hardly needs reporting, but just in case there should be any doubt, there is also a very attractive lake a very short distance away from the house! 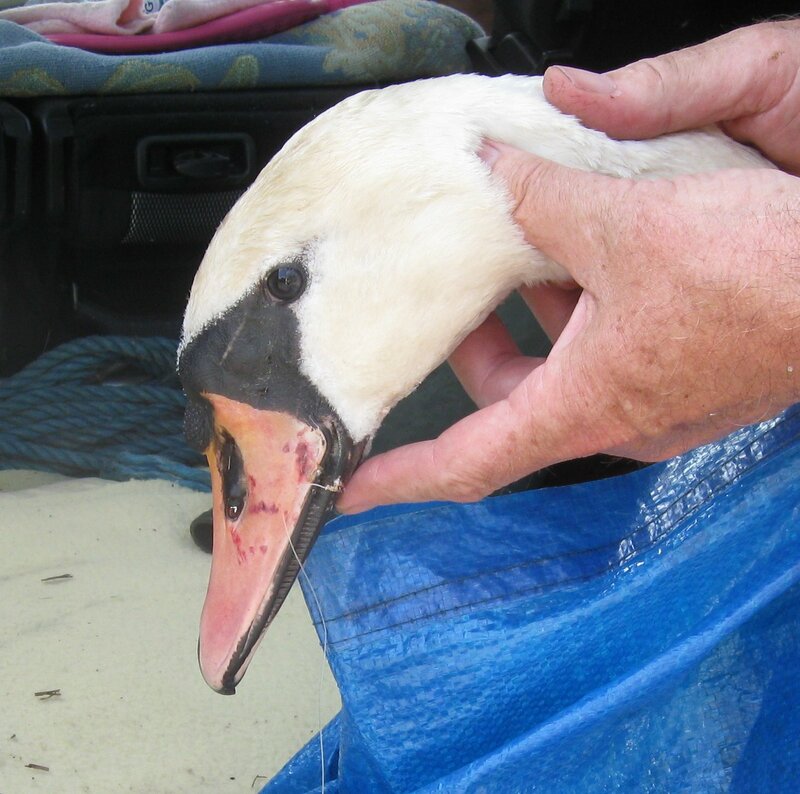 Swan Rescue South Wales has had a very long association with the property, extending back prior to the implementation of the partial ban on the use of lead weights in angling. We were in fact instrumental in getting angling banned here because of the steady stream of lead poisoned birds arising from here. Much more recently, we have successfully fended off an attempt to reintroduce angling; unfortunately, as will become apparent as you read on, this does not mean there is no angling; there are large carp in the lake, and clearly this presents far too great a temptation for some folks who are obviously quite content to break the rules and have a go, usually by entering through gaps they have created in the boundary fence. Swans have nested here for very many years, and it should come as no surprise to learn we could tell a story every year of the goings on here! 2013 was no different, except in respect of the detail. Seven cygnets hatched, but the first call we received related to a female intruder which was foolish enough to land on the lake on 25th June, and was promptly set upon by the resident cob. It turned out she was already at some disadvantage as a result of a pre-existing problem affecting one eye. Fortunately we were able to remove her from there before too much more damage was done. Next (16th August) was a call relating to one of the cygnets trailing fishing line from a hook caught in its beak. By the time we arrived, it was clear the hook had ‘gone’; but where? All the birds were away out in the middle of the lake – not interested in food, and behaving somewhat warily. However, what we could see, even at some distance, was that one of the cygnets appeared to have a very red foot, the explanation for which was soon to emerge. We were called again later the same day in response to a report that one of the cygnets was bleeding from the web on its left foot. Now we learned what had happened; a disabled member of the public had caught the tackled swan earlier in the day, and, in removing the hook, had lost control of it, had badly pierced his hand with it, and then lost it. We know now, with reasonable certainty, the hook ended up on the bank, or in the shallows, and one of the cygnets had then skewered his foot on it. It was nasty, being close to one of the central bones in his foot – small wonder it bled so profusely. We bound it up, administered antibiotics and released him back to his family the following day. A feature of 2013 for us has been the speed with which some adults appear to have wanted to be rid of their off-spring! And so it was, on 5th September we learned one of the cygnets was being bullied by papa. By now, weighing 8.75 kg. he was a good weight, but we felt still too young to be able to make his own way in the world (and frequently we say we should not anthropomorphise …! ), so we transferred him the following day to the wildlife hospital at West Hatch near Taunton, where we knew he would be with other birds of similar age, until a more realistic release age had been attained. The next to go was given his marching orders on 24th September. He flew out, but didn’t get very far. The south end of the lake is separated from a housing estate by a 3 metre high paling fence; our friend was the other side of the fence, trying desperately to return home, but at this time of year there is absolutely no point in this, so, a little while later he was released into a local non-breeding flock. Surprisingly, given the story so far, we heard nothing more until 21st December – Saturday before Christmas. We were called away from a fund raising event barely two miles from TredegarPark. This time, the cygnet had attempted to fly north, but this time came down on the eastbound entry slip road at M4 Junction 28 – not a good place to be! Anyway, it was two very relieved Highways Agency officers who were happy for us to take over, and so allowing them to re-open the road properly. Five days later, and over a period of 48 hours, the remaining three birds (2 male, 1 female) led us a merry dance. Finally, we did manage to catch the two males in quite separate locations – both, mercifully unharmed, but some time between the final evening and the following morning, the female must have got the message; despite a very extensive search in very heavy rain, we found to sign of her, so we have to assume she had flown out safely. In a while, the 2014 story will start to emerge. Postscript: During our search for the young female, we met a couple walking their dog; they are ‘regulars’ at Tredegar Park, and clearly are interested and concerned for the welfare of the swans. They called us on 4th. January to say they had seen the ‘missing’ swan on the Red Pond away over on the other side of the park. We went down there as soon as we could, but it was obvious right away we were not going to catch her – she was so very wary. The following day, we had another call to say the adults were also on the Red Pond, and were not allowing the young bird onto the water. Once again, we went down; it was clear the cygnet recognised it faced a real dilemma! As we approached, and with some reluctance, she went back on the water, only to realise the adults were advancing on her again. With the same reluctance, she clambered back up onto the bank, obviously hoping to elude us, armed as we were with our swan hooks. Fortunately, that was not to be, and very quickly we had her safely in the car, and were on our way to release her at The Knap. It was not obvious that she recognised her two male siblings released there a week earlier! This story was written by Maggie of Clouds Hill Bristol, and edited by Peter; she chairs the Friends of St. George Park Bristol, and is an ardent campaigner for improvements to the local environment, and in particular for there to be far tighter control of angling, and if there is no improvement, for angling to be banned. This morning (Thursday 9th. January), a group of rescuers gathered on the edge of St. George Lake to attempt the rescue of the last remaining cygnet of seven hatched early last spring. Reports from local people had reached the Park Keeper that the cygnet wasn’t feeding and appeared listless. 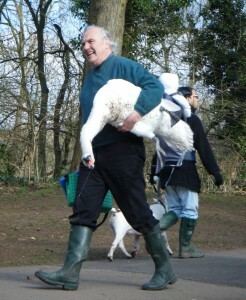 Several attempts to catch the cygnet had failed, so Swan Rescue which is based in South Wales were called. 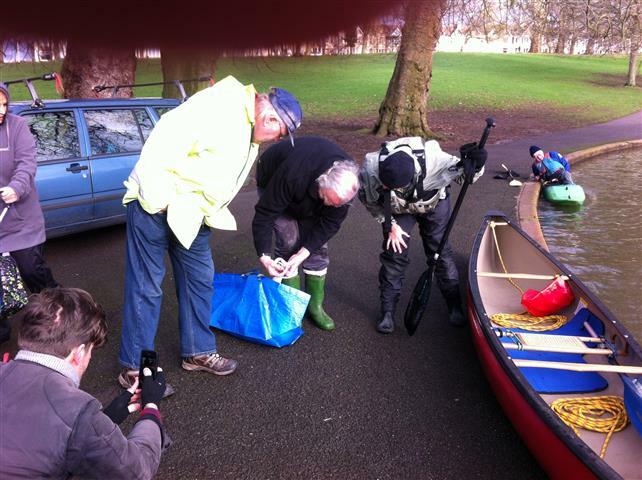 The assistance of canoeists from North Avon Canoe Club based in Yate was also obtained, with the aim of corralling the cygnet into a location where it could be caught easily using a swan hook. The cygnet which hadn’t eaten for 5 or 6 days obliged, and was soon secured in a special swan wrap in which it could be inspected. It was clear immediately the swan carried a ‘chinstrap’ – fishing line, passing under the lower part of the beak, with one end then swallowed down each side of the tongue. Naturally, the line is pulled progressively tighter by the gizzard – part of the digestive system – and so is cutting deeper and deeper into the flesh. Without this rescue, it would have died a slow and painful death. In this case, the line was simply cut with a pair of scissors, so releasing the tension immediately. The cygnet will be taken to the National Swan Sanctuary at Shepperton to undergo a thorough check – possibly including X-rays – to look for swallowed hooks. 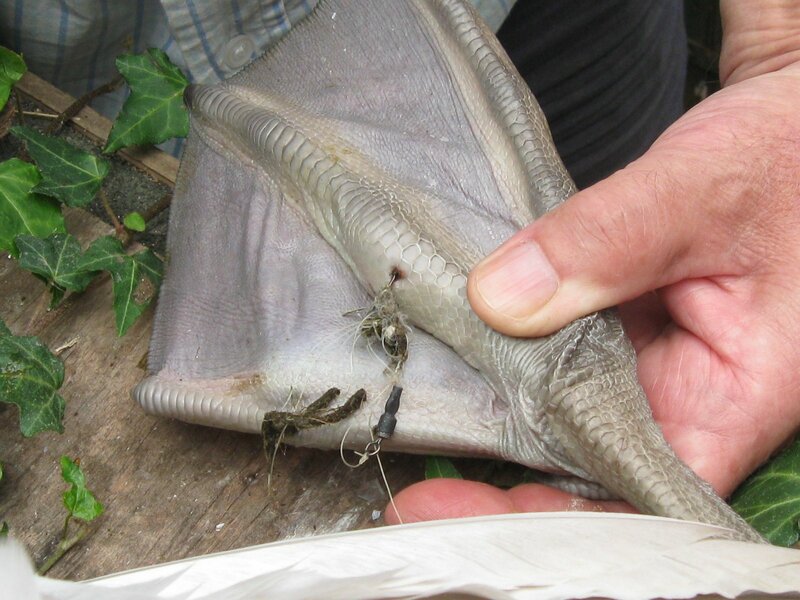 Peter stressed the point fishing line must never be pulled out because, if there is a hook on the end, it will cause horrendous damage; someone did attempt this with one of the other cygnets last year, resulting in a 5″ tear in the aesophagus. In 2012, six of the seven cygnets hatched on the lake either died or had to be rescued as a result of fishing tackle related injuries; in 2013, four out of the seven suffered a similar fate, while the other three disappeared not long after hatching. Fishing is allowed on park lakes within designated areas despite public objection; Bristol City Council are introducing a free permit system on St. George Lake which local people fear will encourage more people to fish. Policing a system like this, out of hours, on long summer evenings is going to be a costly business, and one the Council cannot afford right now. It’s high time we did a bit of catching up; so, of necessity, this will be a bit skimpy! All photographs in what follows,except the Wells swan ringing the bell ( yet to be posted) are by Ellen. 01.01. Called to Cosmeston LCP to provide assistance to a very wet and underweight (only 520 grams) Buzzard. Sadly, he was too far gone, but at least he died in the warm …. 04.01. To Cyfarthfa Castle, Merthyr in response to a report of a major dispute between a Canada Goose and a Muscovy Duck; observed for nearly an hour in the cold, during which time saw nothing untoward. From here to Blaen-y-Pant, Newport in response to a report a lone swan had a lump in his neck. Unable to confirm this, but realised this bird was one we had released at The Knap on 11th. December, and which had been driven from Blaen-y-Pant onto Malpas Road on 24th. November. All seemed to be well, so no action taken at this time … but watch this space for our March stories …! 06.01. Distressed bat recovered from an address in Tongwnlais – eventually started to feed itself after 2 – 3 weeks; now (mid-March) waiting for some warmer weather in order to release it. 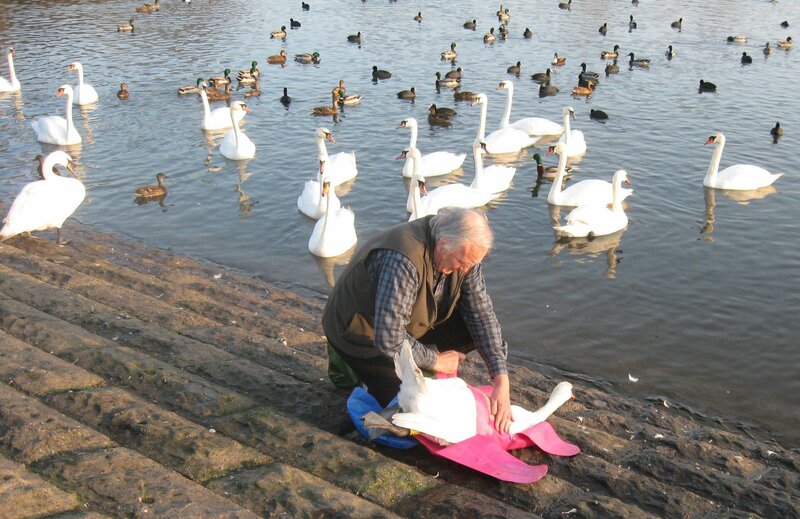 Steve helped out by retrieving a pair of swans from Rhoose Point; they had arrived there and, immediately, had incurred the wrath of the resident pair, and were driven off – exhausted. The female had been ringed 18 months earlier at Cosmeston LCP. This pair was eventually re-homed on a private pond in Wiltshire. A new home for the Rhoose Point invaders. 08.01. To Holme Lacey, Herefordshire to follow up a report of a distressed swan (territorial dispute?) on flooded flood plain. All appeared very peaceful; no action required. Did our best to reassure her the swan was uninjured, and not in any sense in danger. 10.01. Call from Estates Dept. Yate Town Council regarding lone juvenile (aka ‘Lily’) on Brinsham Fields pond which was carrying fishing line from its beak; decided to leave this one to Neil and Teresa, who succeeded in de-tackling her on14th, but visited Kingsgate Park where a territorial dispute had broken out; see our newsletter No. 44. Removed, into care to RSPCA West Hatch, a large friendly juvenile’ belonging’ to the incoming adult pair. 11.01. Grounded juvenile on southbound entry slip road to Link Road at Leckwith rescued and into care – also at West Hatch. Received report of ‘tackled’ swan off Cardiff Bay Yacht Club – dealt with by the ‘locals’. 15.01. 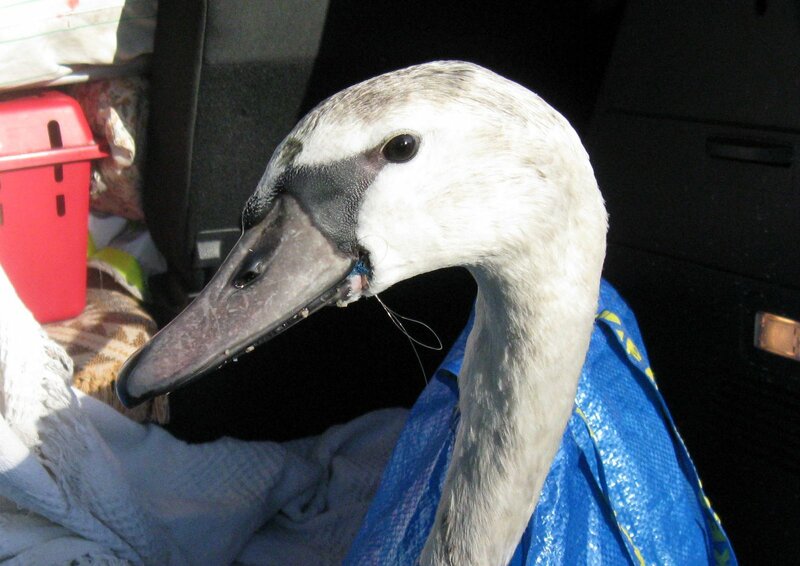 Female of a pair on canal at Jersey Marine, Swansea reported to be unable to walk; attended the following day and taken to National Swan Sanctuary on 17th., along with very underweight juvenile retrieved from industrial area at Lydney. The Jersey Marine pair a short while before she became unable to walk. 18.01. Very heavy snow overnight – confined to barracks! 20.01. Call from police in Bristol; grounded adult swan on St. Pauls Causeway. Attended, but RSPCA arrived minutes earlier. 21.01. Another Buzzard call; on river bank (R. Rhymney) near Michaelstone. Very weak and underweight (616 grams); took it to Vale Wildlife Rescue immediately, but it was too far gone to stand any real chance of surviving. (We don’t have much luck with these …). 22.01. Visit to one of our regular ‘black spots’ Tredelerch Lake off Lamby Way; the cob is trailing fishing line from his beak. By the time we arrived, we have to conclude he must have swallowed it … no sign, and all appears to be well. Almost simultaneously, John calls from Caerphilly Castle moat – the female has a ‘face full of fishing line’, including weights. With the light fast fading, there was little point in going to Caerphilly this evening. 23.01. John calls again; overnight, one way or another, the swan has ‘lost’ the mass of fishing line she was carrying. No further action needed at this time. 25.01. A lone male has been driven from its territory by a pair of incomers at Curry Pool, some distance to the west of Bridgwater in Somerset – we’ve been here a number of times before. It took three of us a while – some patience, and a modicum of guile ( or was it luck) to capture this chap. In a sense, he was trapped and needed to be moved on; we released him at Herriot’s Bridge at the southern end of Chew Valley Lake. He had been ringed as a 2 year old (at least) at Abbotsbury in July 2011. 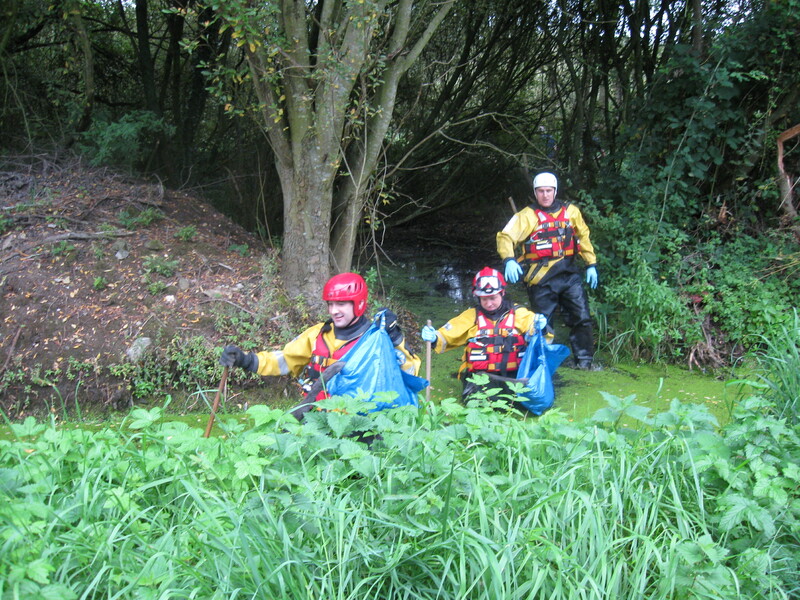 Release of displaced ‘Curry Pool’ male at Herriots Bridge. 27.02. Desperate call from a tennis coach at St Georges Park, Bristol; a juvenile from the adjacent lake had landed on one of the tennis courts; easy to catch! Took advantage of the situation to remove the other last remaining juvenile from the lake; it was clear the adults were indicating strongly to their off-spring it was time to move on, and the local history is littered with problems of such birds coming down in the surrounding built up area. Both these birds were released at The Knap, Barry. 28.01. 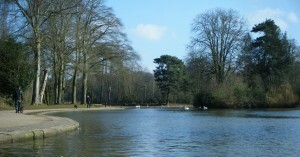 Roath Park Lake, Cardiff is very full as a result of all the recent melt water. A juvenile had been swept down the flume at the south end of the lake, and was looking very sorry for itself; successful rescue and taken into care. Simultaneously, received a call from car-park attendant at Neath- Port Talbot Hospital concerned at inability of one of the cygnets to move. This is a really long and complicated story, but it culminated in, guess what ? – another territorial dispute resulting in the resident pair being displaced, but complicated by the fact the female had gone awol at the time of our visit; she reappeared the following day, and had to be rescued from the invaders by Brenda and Trevor. There really are many twists and turns to this story, but the adults ended up on the moat at the Bishop’s Palace at Wells Cathedral in Somerset. Wash and brush up, shortly after arrival at Wells. NB Further picture to appear here when system behaves itself! 29.01. To Shepperton with the Roath Park swan from yesterday,returning with a fully restored female to be taken back to Jersey Marine tomorrow. 30.01. Gave a ‘swan talk’ to Machen Probus Club this morning, and then down to Swansea to release the female at Jersey Marine. Over the years, we’ve not had much luck with joyful reunions, and this was no exception. When we arrived, there was no sign of the cob, so we had no option but simply to release her. As soon as the wrap was off, she was gone – barely on the water before she was airborne and flying, it seemed as fast as she could, westwards towards Port Tennant and Swansea. While all this was going on, we received a call from Teresa to tell us, once again that Lily is carrying yet another chinstrap. Here beginneth yet another saga…. 31.01. To Shepperton once again with the female from Neath-Port Talbot Hospital – this was an excellent reunion – and three birds form The Secret World of Nature which were in need of long term specialist care. Called back via Brinsham, Yate to see if we stood any chance of catching Lily; definitely none whatsoever …! And we don’t just rescue swans. Even although we are primarily a swan rescue group nevertheless we will help any wildlife in distress whenever its needed and whatever the problem but in this case our role was more a supporting one as the providers of transport although in the end to also provide some extra muscle when it came to the actual rescue itself. The phone rang – it was a call for help from Alex who had just had an urgent message from Steve in Chepstow, a member of the Gwent Badger Group, about a badger trapped in a rubbish bin at an address in Machen off the A468 towards Caerffili. Alex is a trainee veterinary nurse at Summerhill veterinary practice in Newport. He runs a small but very effective wildlife treatment and rehabilitation operation with the encouragement and full support of the resident vets who allow him the use of the fascilites at the practice. This is a big advantage when treating the many wildlife casualties he is called on to deal with. 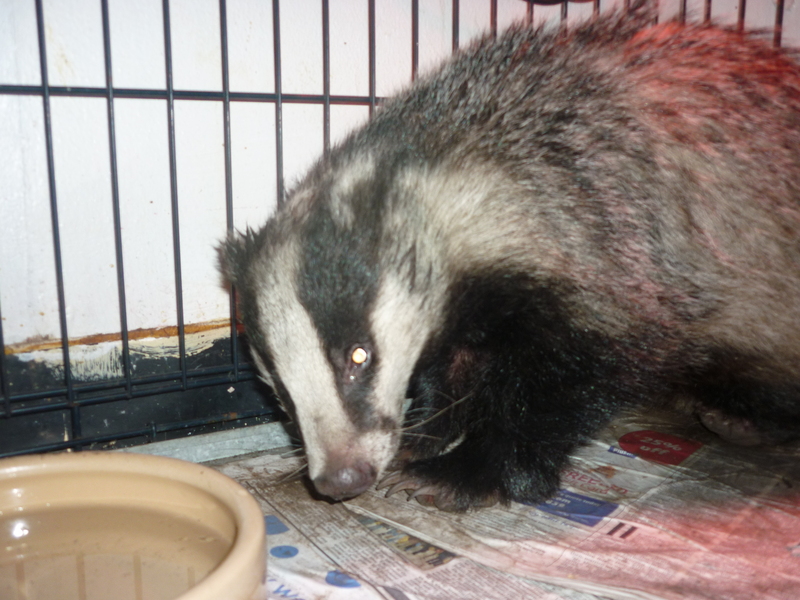 The badger it seems was unhurt despite him having been in the compost bin for possibly as long as four days. It was obvious he must have been attracted by the smell of what was to him, some tasty scraps discarded by the owner and because of the bin’s conical shape was totally incapable of clambering out unaided. And, for us humans, it really was a struggle too as the bin itself had been established at least sixteen years previously and buried about a foot below ground level. It was a difficult situation and no amount of digging allowed the bin to be moved. Eventually a suggestion was made to try shovelling small turfs into the bin which would bring the badger nearer to the top. It worked and as he struggled to climb out Alex was able to slip the grasper (a humane gadget for catching badgers and foxes) under the badger’s shoulders and haul him out and get him quickly into the carrying box Alex had brought with him. The poor animal was quite unrecognisable as a badger – he was black, greasy and extremely smelly. Safely secured in the box and covered with a thick towel to keep him calm we returned to Summerhill for Alex to work his magic – sedation, a thorough body check to see there were no injuries, and a ‘hose down’ – he was grubby to say the least, but in particular, his ears were full of some fine particulate and unknown disgusting substance which needed to be cleaned out. 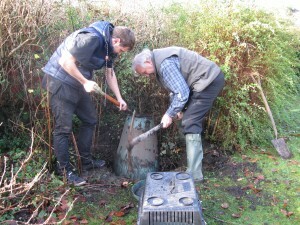 Later that evening we received a call from Alex with a progress update on the badger. Having been thoroughly washed and dried off at last he looked like a badger and after a large meal was ready to be released back into the area from which he came – now minus the compost bin. But this was Alex’s job – with a little help from Steve, of course. The Story of Two Swans and a Train; 29th February. If you at all superstitious, you could be forgiven for being thankful 29th February occurs no more frequently than once every four years; to assess the significance of this opening remark, just read on, but suffice to say, to have a plan in place for any particular day is often sufficient of itself to put the mockers on it! The central plank in the plan was to treat an elderly relative who lives just outside Swindon to lunch out – something which had been promised since before Christmas, but which, for a whole variety of reasons had been put off, re-planned and postponed again. Once again, today was to be the day. A secondary objective was to give one of our cars a bit of a run – it was short of a decent run in some months, so that seemed like a good thing to do. As it turned out, this too was a bad mistake because this car does not routinely carry any swan rescue equipment. Anyway, to start at the beginning, things seemed to be going reasonably well, with mundane routine stuff being sorted; a cheque to pay into the bank, specs to be adjusted and a hearing test negotiated successfully. There was a little ‘background noise’; a call about a potential bat problem (yes, we also deal with bats), out towards Chepstow, and a report of a poorly duck at Cardiff Bay Yacht Club, which we were able to ask Vik to deal with. So, having deliberately slowed down a bit in order not to arrive in Swindon too early, a leisurely coffee was taken. That done, we headed for the motorway. Before we got there, the phone rang – almost always the harbinger of bad news, and this was no exception. The Police and Network Rail had been on to report a problem at Magor involving two swans on the railway line, and, sadly, a passing train. Configured as we were at that particular moment was not ideal – not dressed appropriately, and with no equipment, so the first step was to assess the situation as quickly as possible, and so to Magor, now in convoy. 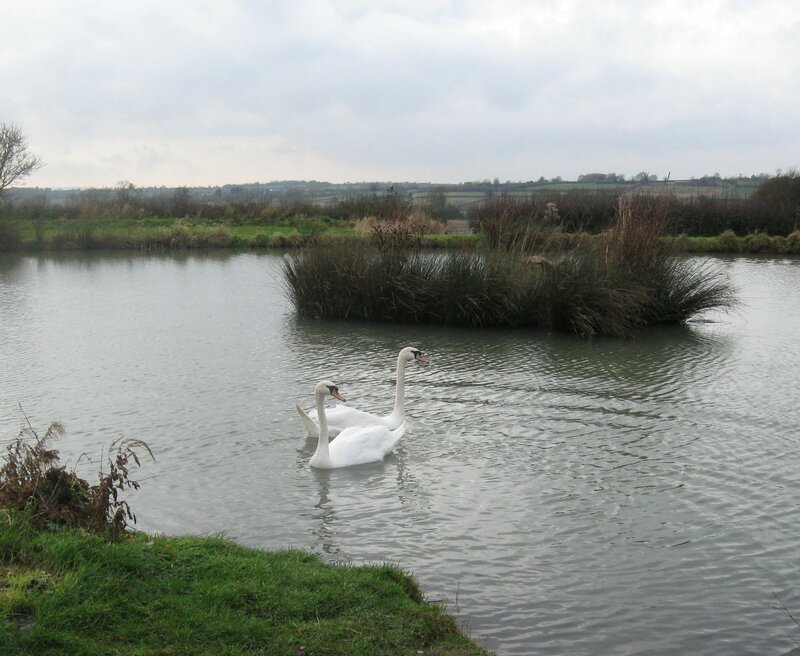 It was quickly apparent one of the two swans had been killed instantly, and Network Rail would assume responsibility for removing the remains from the track. It took us a little time to locate the surviving mate, but Len, our local contact helped us out. At Magor, there is a reen which passes from the village, under the railway line before running south parallel to Whitewall; this was where we found the swan. At this stage it was not possible to see if she was hurt, and if so, how badly; there was a certain amount of blood which was coming from damage to her beak. However, what was clear was there was an urgent need to catch her; time now for a rapid reorganisation! 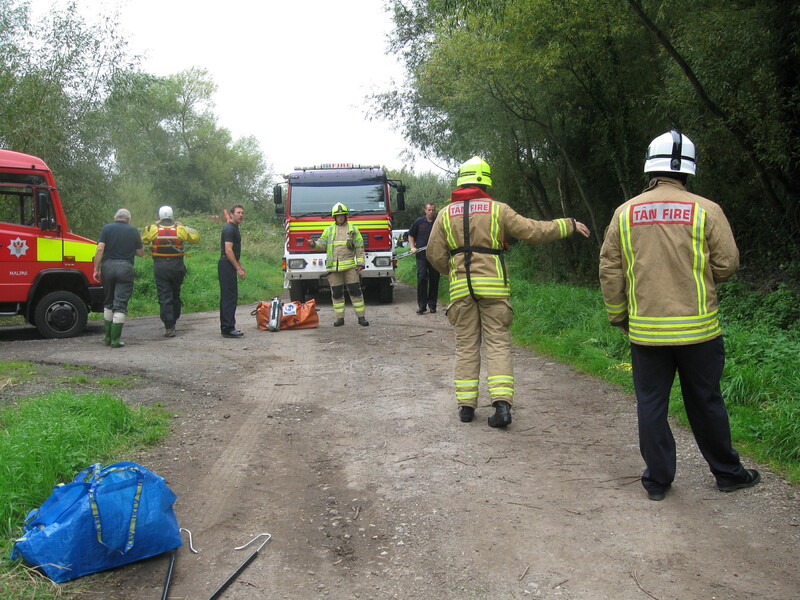 Return to base, change into ‘dirty’ rescue clothes and switch cars; a concern we did have was that while we were away, the injured swan could be lost – worst case scenario would have been for her to escape under the railway line. Against this possibility, Len and a couple of his friends stayed around, and would, if necessary have taken steps to prevent her from going far. 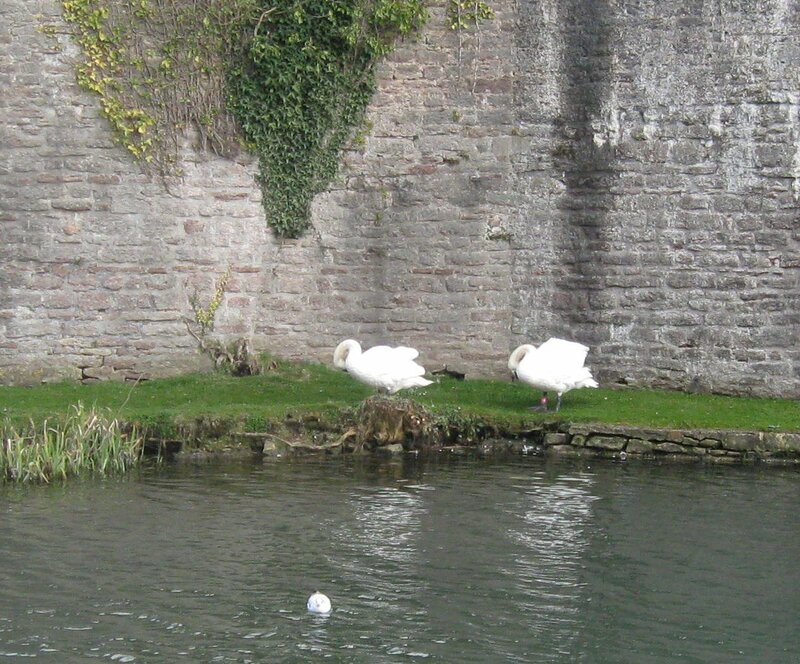 As it turned out, we need not have worried; when we arrived back in Magor, the swan was resting quietly in the reen. The only trouble was the depth and steepness of the bank, but we managed to overcome this by careful use of a swan hook, notwithstanding a dense fresh emergence of stinging nettles on the bank! Having caught the bird, there were no further decisions to be made; our next stop would automatically be the National Swan Sanctuary at Shepperton. In such dire situations, we always phone ahead; this ensures there is a reception party, and consequently there is no delay in starting treatment. The assessment of the state of the swan showed, in addition to the beak injury, a broken left ankle and a deep penetrating wound to the lower right side of the abdomen. Pain relief and antibiotics were administered right away as usual, after which she was put in a pen with a couple of other casualties, to await the arrival of the vet, later that evening. In herself, she seemed bright and quite perky – was even able to walk quite well in spite of her broken foot. The bird was operated on that evening – a lengthy and fairly bloody procedure; the main concern being to attend to damage to air sacs. The operation went well and the report the following morning suggested she was on the way – albeit it would be very slow – to making a good recovery. Sadly, we received a call a day later to say the swan died around 5.00 a.m. that morning. It had become necessary to carry out some further surgical work, because the injury was so severe, and we have to assume it all proved just too much. Incidentally, on the way home from Shepperton, there was a report telling us a swan had become tangled in fishing tackle at Tredelerch Lake off Lamby Way in Cardiff, so that too had to be attended to before we could bring down the curtain on another traumatic day. See what we mean by the jinxed nature of 29th. February? 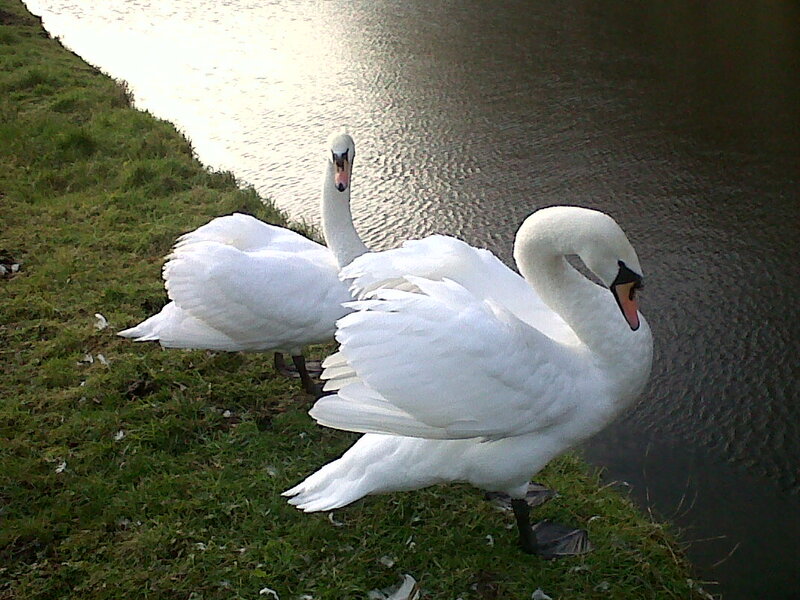 Posted in Uncategorized	| Comments Off on The Story of Two Swans and a Train; 29th February. I hear from Peter and Ellen earlier today, with the really bad news that the Swan that we had taken from Eastville Lake on Monday (see previous blog entry) had died during the night. In Peter’s words – “Regrettably, during the night, the condition of the swan deteriorated, and he died. Subsequent examination confirmed the presence of a small hook, weights and a length of line in the bird’s neck, and a very severely impacted gizzard. The swan had been taking food, but had deteriorated to the point where he was no longer able to digest it. On a personal note, having been to a friend’s funeral already today, I could have done without this. To borrow a phrase I’ve already seen once today, “The Swan leaves a mate and a number of young“. And why? So some bloody “sportsman” (and I use the term quite wrongly), can enjoy outwitting, catching and tormenting small fish! Fish that he will not be eating. Fish that have a brain about the size of a lentil. But the mighty sportsman has outwitted the wild creature! 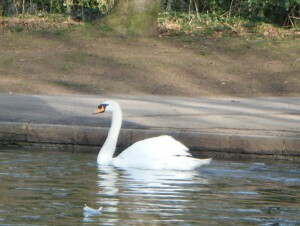 And in the process, one of these mighty sportsmen has discarded some tackle that has cost the life of a beautiful swan. I know that anglers claim that fish don’t feel pain when they end up with a hook in the face (or even further down the throat), and I’m sure that the fish really enjoys the chase just as much as the lentil brained sportsman does. However, I’m not so sure that the swan, discarded tackle tearing its belly open from the inside, really enjoyed the experience. Come on, fishermen! Increase the size of your lentil, and sit by the lake with a book instead of this lethal fishing tackle. And if you really can’t give up your unsociable habit, please take more care to ensure that you don’t leave discarded tackle behind. This is just MY view – having donated a few days of my time in the last fortnight to “the cause”, and a tiny fraction of the time and expense that Peter and Ellen have put in during the same fortnight. And the last 35 years or so. This stupid, needless death caused by carelessness and complacency offends and upsets me. I wonder if I’ll be asked to tone it down? Perhaps I can get some of the autopsy photos? I don’t like mornings – and Monday mornings are the pits! However, I answered my Summons and presented myself at Ellen’s at 10am, with kayak on car roof. Peter and Ellen were ready to go, so we disappeared off to Bristol again. This was about the third time in the last two weeks for me, but I suspect Peter and Ellen had done a few trips without me. Down the M32 to Bristol, and off at the second junction. Around the interchange, nearly back the way we had came, and then under the flyover and into Eastville Park. There were a few dog walkers and cyclists giving us the “evil eye” for driving along their path, but I’m getting used to that. After a few hundred yards we arrived at the end of a small ornamental lake, with about eight swans and a few geese and ducks visible. Chris was already there, and within a few minutes we were joined by Gordon, Phil, and one or two others that I was introduced to but regret to say can’t remember their names. I know one was NOT Ian! Anyway, one of these swans was well entangled in fishing tackle, line (and probably hook) down the throat, shot weight and float hanging from the beak. The swan had been refusing food for a few days and the alarm had been raised. And we were mob handed. We launched our canoes and kayaks and headed down the lake. The one we were after was part of a group of three at the far end, behind the islands. 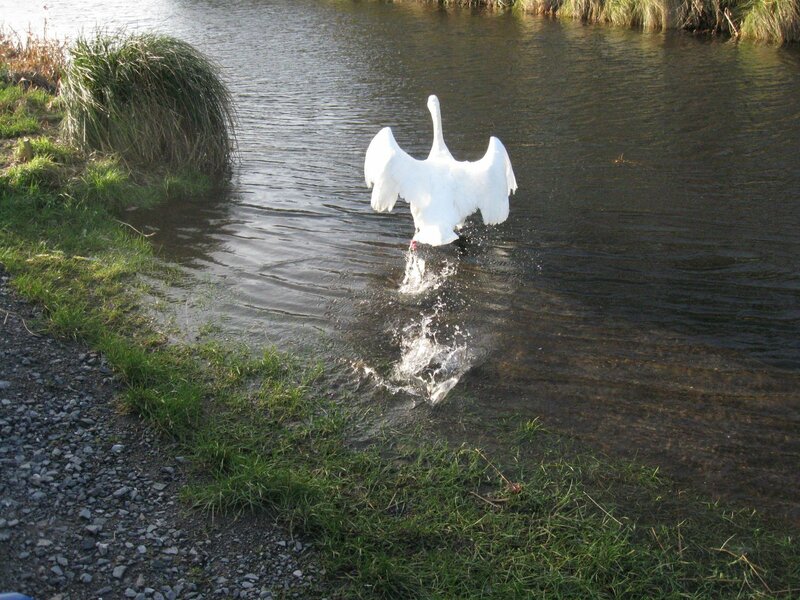 By the time we approached them, the swans that we had already passed took flight and got in front of us. Normally it’s the other way round. So we paddled gently through the flock, and spotted the one with the bright orange fishing float hanging from its beak. The interlopers took off up the other end of the lake, leaving the target and its mate. The mate had more energy than the target, and we managed to separate them and “persuade” the target swan in to the far end of the lake. There was a contraption here to encourage foliage to grow, and this formed a useful barrier, leaving two smaller gaps to be filled by canoes. The swan was now trapped in an area perhaps 25m square. Unfortunately, the swan didn’t realise it was trapped, and it was off again, through gaps between boats, and up around the island again. And in the commotion, it lost the float. Repeat the exercise, pen it in the corner, and then try and gently “crowd it out” until it decided that it wanted out of the lake, hopped up on the side, where Peter was waiting to pounce. A few minutes later the swan was safely in a wrap, and the line was being examined. As there is great danger of doing a lot of harm if there is a hook caught down the throat, you do not go yanking on it (although that had probably already happened as it struggled to get away from us and tore the float off). Tonight the swan is in Newport. 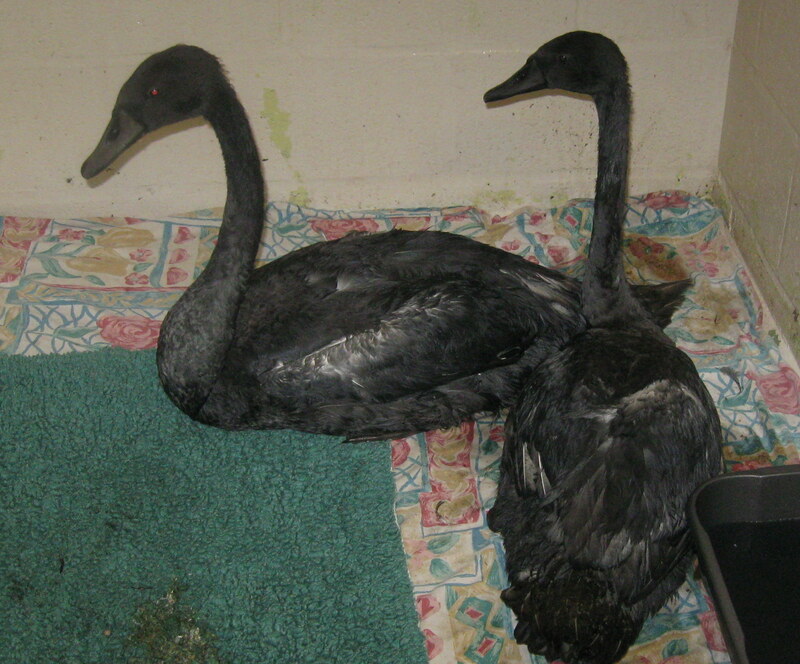 Tomorrow it’ll be at the National Swan Sanctuary in Shepperton for an X-Ray – and maybe more. With luck it’ll be returned in a day or so, without distressing its mate too much. Our activities attracted quite a bit of attention from the public, the Parkie, and the dogs walking their people. 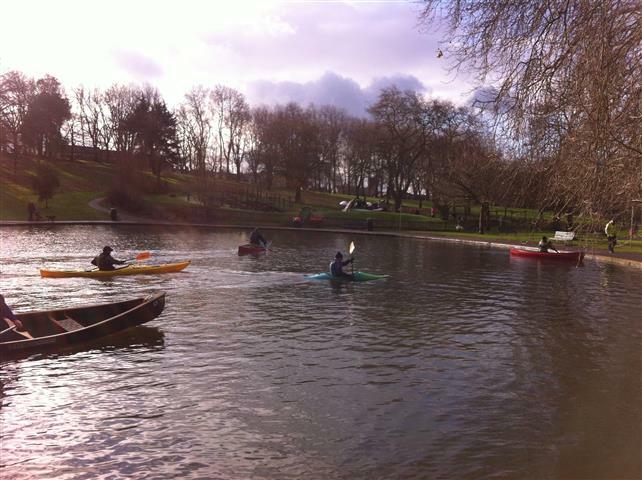 And the canoeists were great (even if I do say so) – many thanks for the help, we couldn’t have done it without you. And thanks for all the photos – I plan on getting round to adding them! It’s Not Only Swans We Deal With – Another Busy Day (20th February). Another busy day involving a Tawny Owl, a Buzzard, a one winged Mute Swan and a dead swan (probably its mate). Two weeks earlier the owl had been found entangled in fishing line and hanging from a tree in the wooded River Sirhowy area of Blackwood. The line was wrapped tightly around his right wing and had he not been rescued and taken to Alex, a trainee veterinary nurse at Summerhill veterinary practice in Newport he would certainly have died. Following his treatment he was transferred to the Bird of Prey centre near Monmouth run by Helen Scourse for some rehab and practice flying before he was ready for release – one of the tasks we had planned for that evening. We always try to release wild birds and animals, particularly those which are nocturnal, back to the area they came from (or even from which they came!!!!!). The Buzzard was a road casualty and had been brought to Alex some days earlier suffering head trauma but now he was ready to go into a flight aviary so it was a case of in with one (the buzzard) and out with the other (the tawny owl). Next on our list was Symonds Yat to look for a poorly swan which had been reported to us the previous evening when we arrived back from a fund raising event in Cardiff. The report said the bird had struggled out of the water and had collapsed. Unfortunately by then, little daylight remained, but we took a chance on there being enough for us to locate the swan even although the directions we had been given were rather vague. 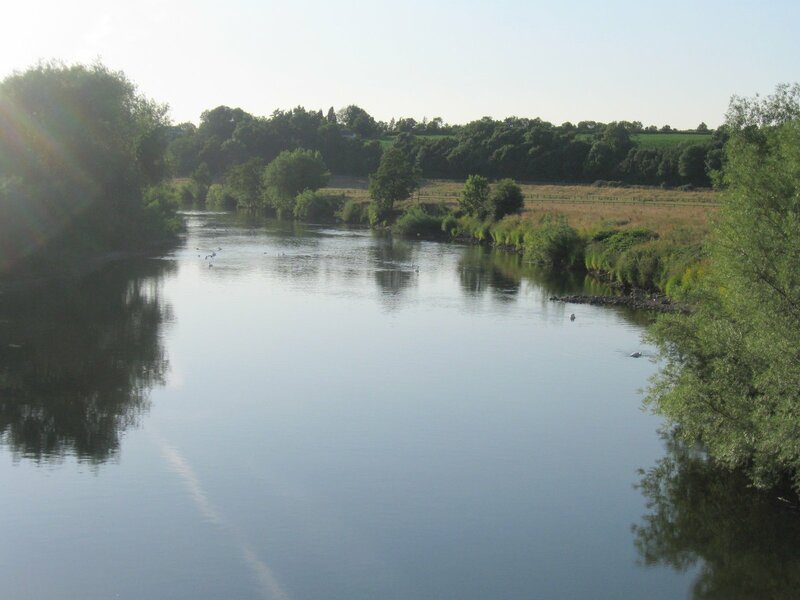 We were unaware it had been seen by a visiting member of the public who had since left the area, several hundred yards on along the river which, had we known at the time, made our journey rather pointless. But of course, we had to try. Back at Symonds Yat again we were now being told a different story by several people who had seen a dead swan a further half mile down the river. This was too much of a coincidence – it had to be the one we had looked for the previous evening. We found him. He was an adult swan and very underweight – weighing only 6.9 kgs, then we discovered the reason. He had an extremely tight chinstrap caused by some carelessly discarded fishing line which had obviously prevented him from feeding; it seems likely he picked this up as long as two weeks earlier. This beautiful swan had starved to death. One can’t help but wonder where that fisherman went after having enjoyed his few hours by the river and without giving a thought to the loss of that lethal length of line and the possible problems it might cause to the resident wildlife. Before we left Symonds Yat we decided to check the one remaining swan (possibly the mate) which was being fed by some visitors to the area. As we watched we could see something was wrong with its right wing; half of it was missing. From the state of her beak and feathering it looked as if there had already been a territorial dispute at sometime in the recent past so we decided we needed to take her into care for her own safety. She also was slightly underweight – just 8.00 kgs. As we examined her we even more convinced we had done the right thing because clearly one leg was not functioning as it should – clearly there was a weakness there. Finally as we settled her for the night, including making sure she had enough to eat – and quite clearly she was very hungry – it became evident her eyesight was also impaired; she could see, but her responses were on the slow side. Obviously, she was to be one of our passengers on our next trip to the National Swan Sanctuary at Shepperton. Posted in Uncategorized	| Comments Off on It’s Not Only Swans We Deal With – Another Busy Day (20th February).